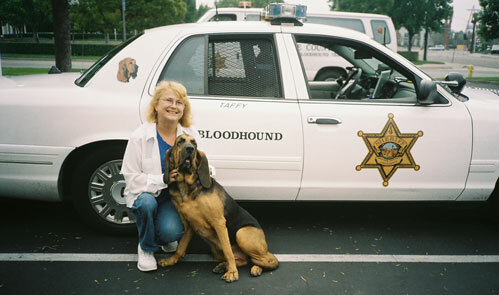 The name was painted on the door of the Orange County Sheriff’s Department cruiser when I pulled into the industrial park on Sunday morning: Taffy Bloodhound. I had obviously come to the right place. It was way too early and way too far from home, but the opportunity to go along on a Bloodhound Training was irresistible and any doubts evaporated once I met my namesake. She was a modest, unassuming lass with a pleasant disposition and an incredibly evolved sniffer. I liked her immediately. 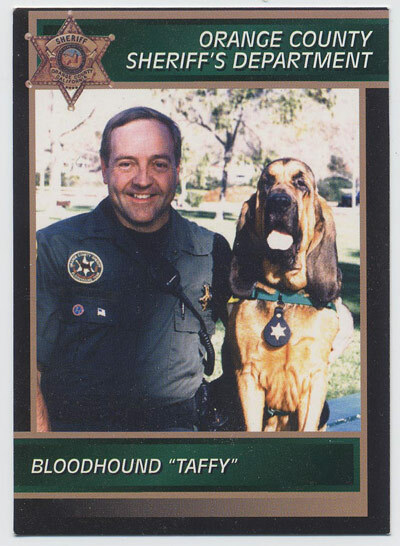 Taffy’s been on the job for a number of years. She’s found lost children and Alzheimer’s patients who’ve meandered away, and she loves nothing more than to capture a bad guy who thought he’d gotten away because he couldn’t see anybody following him. Needless to say, when the exercises began, Taffy found the “criminals” first. I’d expect no less. Taffy was born in Thetford Mines, Quebec, Canada. She flew in to meet her partner and trainer, Doug, in June 2000 when she was just 12 weeks old. 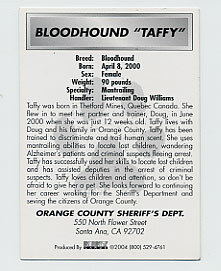 Taffy lives with Doug and his family in Orange County. Taffy has been trained to discriminate and trail human scent. She uses mantrailing abilities to locate lost children, wandering Alzheimer’s patients and criminal suspects fleeing arrest. Taffy has successfully used her skills to locate lost children and has assisted deputies in the arrest of criminal suspects. Taffy loves children and attention, so don’t be afraid to give her a pet. She looks forwarding to continuing her career working for the Sheriff’s Department and serving the citizens of Orange County.